In September 2011, Saks Fifth Avenue’s Corporate Asset Protection team initiated an investigation involving merchandise thefts originating from a trucking consolidator used by Saks and many other retailers. Saks’ Asset Protection team, led by Samuel Edge, networked with other luxury retailers and learned from Neiman Marcus’ James Stark, Director of Loss Prevention, Neiman Marcus Direct that they too were conducting an investigation of similar shortages mostly from designers such as Gucci, YSL, Chanel and Tory Burch. 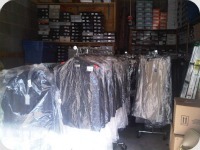 Over the next three months, through the tracking of drivers, the analysis of missing merchandise and investigative research using various social media databases, Saks Fifth Avenue Asset Protection discovered that several drivers were compromising the deliveries and then reselling the merchandise to a fence located in Northern New Jersey. Saks Fifth Avenue presented the evidence to the New Jersey State Police Cargo Theft Unit who immediately took the case. Within weeks, a search warrant was issued and on December 9, 2011, Saks Fifth Avenue, Neiman Marcus and several other retailers joined the NJSP in the execution of the warrant. Inside the storefront the retailers discovered well over $2 million of their stolen merchandise. Over the next few days Saks and Neiman Marcus worked together on inventorying their merchandise and when it was completed, Saks had recovered approximately $600,000 of stolen merchandise while Neiman Marcus had recovered approximately $200,000. The success of the investigation was due to the diligence and teamwork between Saks’ Asset Protection, Neiman Marcus Loss Prevention, and various law enforcement agencies.